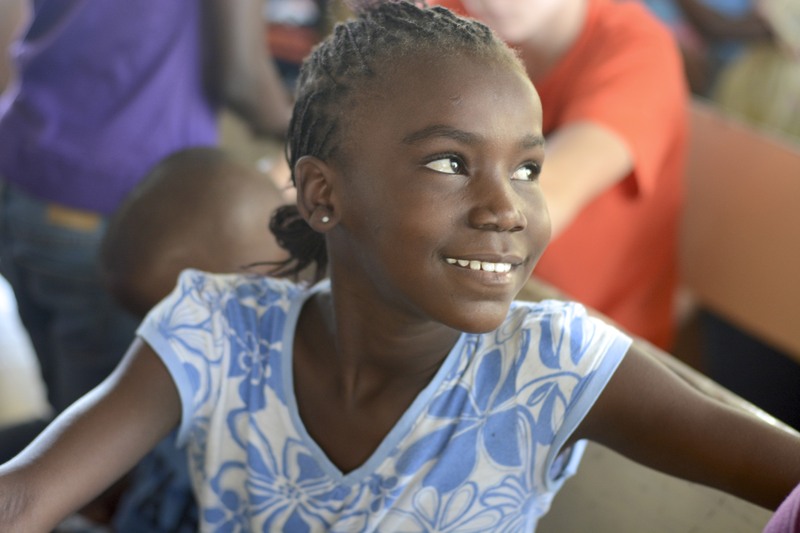 Something really sweet happened last week during the last week of VBS. 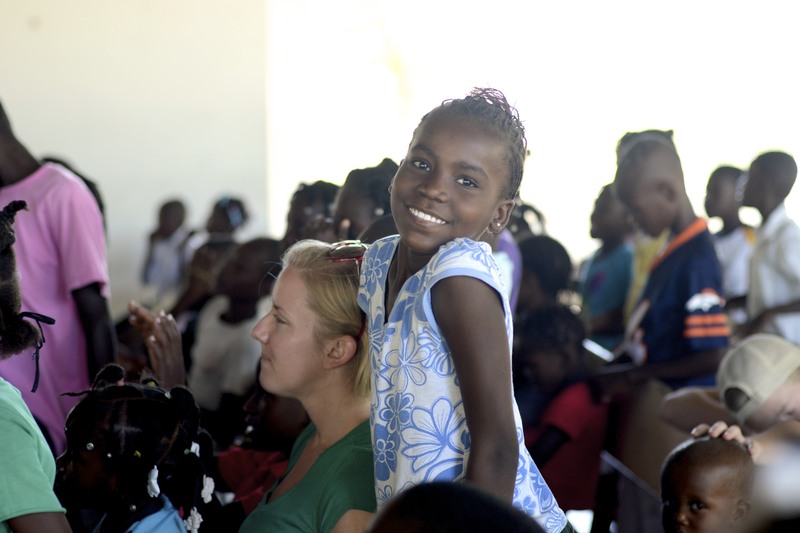 First, lets rewind to week three of VBS. Monday morning, a group of about 430 kids from Titanyen came in the front door of the church for VBS. Every morning I would stand and greet the kids as they came in. Have you ever had one of those moments where you meet someone and know that they’re going to change your life? Maybe I’m alone in that, but I saw a little ten year old girl and we made eye contact. She smiled the most beautiful smile full of joy and I knew my heart was in for something big. Throughout the morning rally I sat by and watched her as she sang songs & danced. My eyes wouldn’t stop filling with tears as I watched her. Sweet Mydaline is 10 years old and is an amputee. I chatted with her a little, got to know her name, age, and found out she has two sisters. 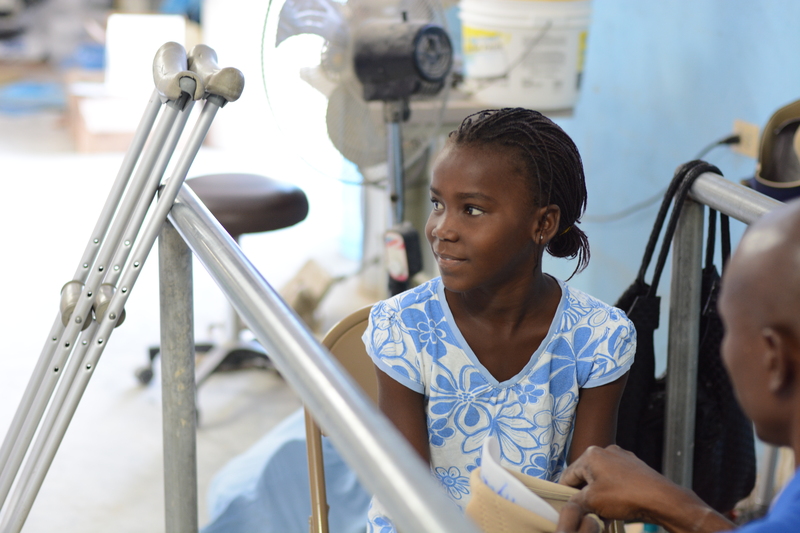 I approached one of our Village Champions and asked him what happened that caused her to lose her leg. He responded with a story that broke my heart & reminded me of the Lord’s grace all at once. 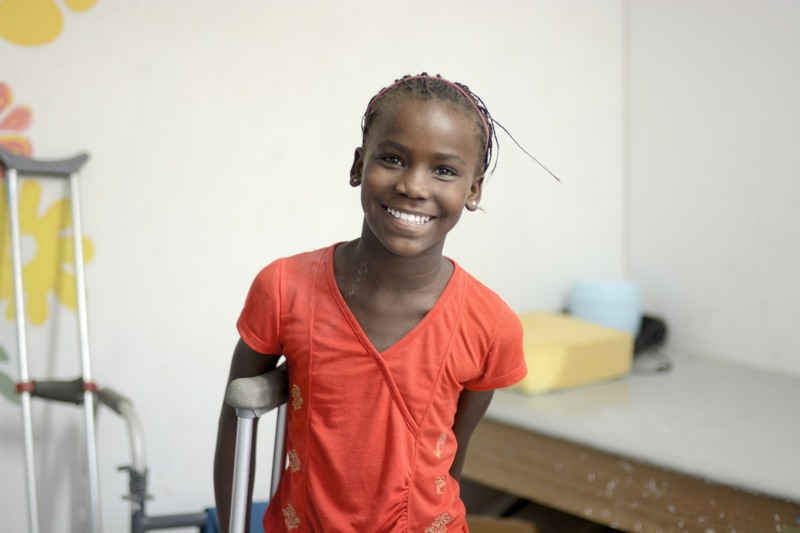 One night in 2012, when Mydaline was 8 years old, her and her family were sleeping in their home in Titanyen. A truck coming down the road, lost control, and crashed into their home in the middle of the night. 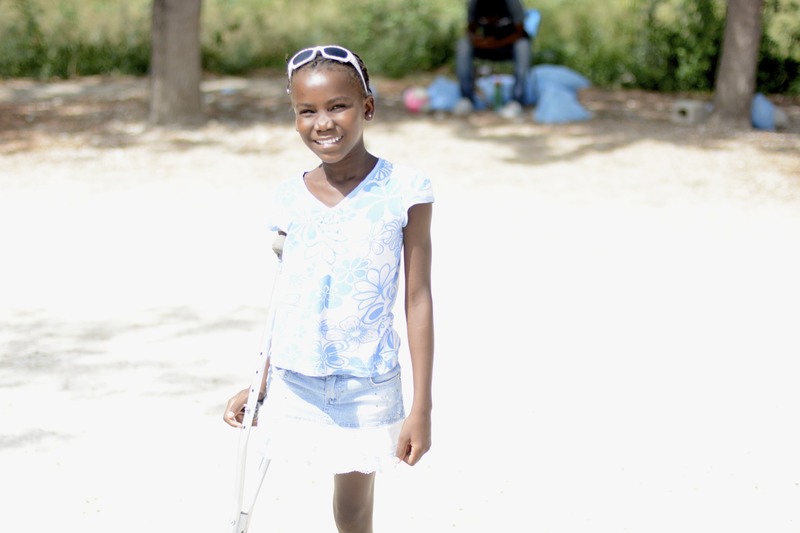 Mydaline lost her grandma that night & lost her leg as a result of the accident. I will never understand why things like that happen. I do, however, see the Lord’s grace all over that night. 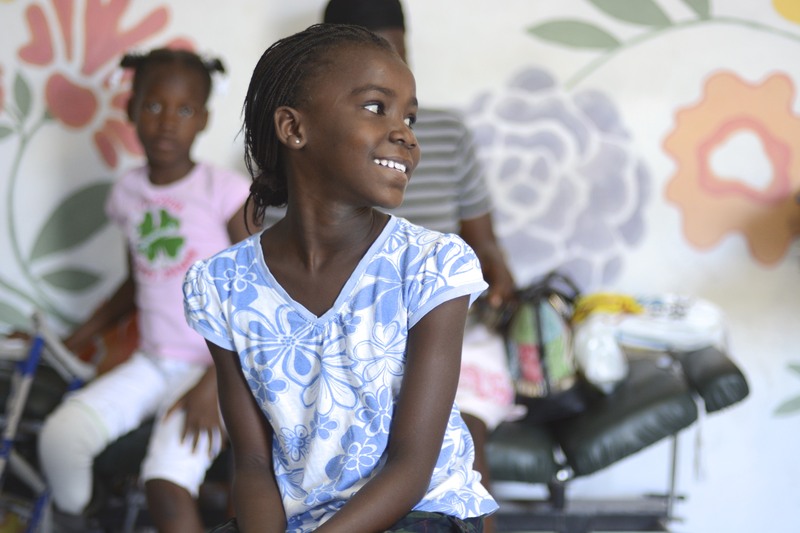 Knowing what I do about healthcare in Haiti and how complicated it can be, I’m amazed that this precious girl survived that night and could receive the surgery she needed to save her life. She lost her leg, but I know she didn’t lose her life for a reason. The Lord is going to use this girl. Fast forward back to the last week of VBS. 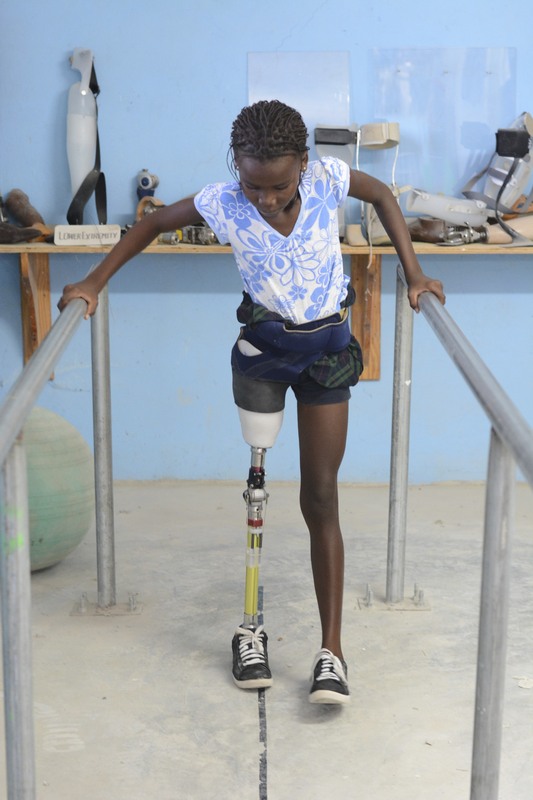 I had been talking with Mydaline’s uncle about getting her into our prosthetics lab to see if we could get her a prosthetic leg. 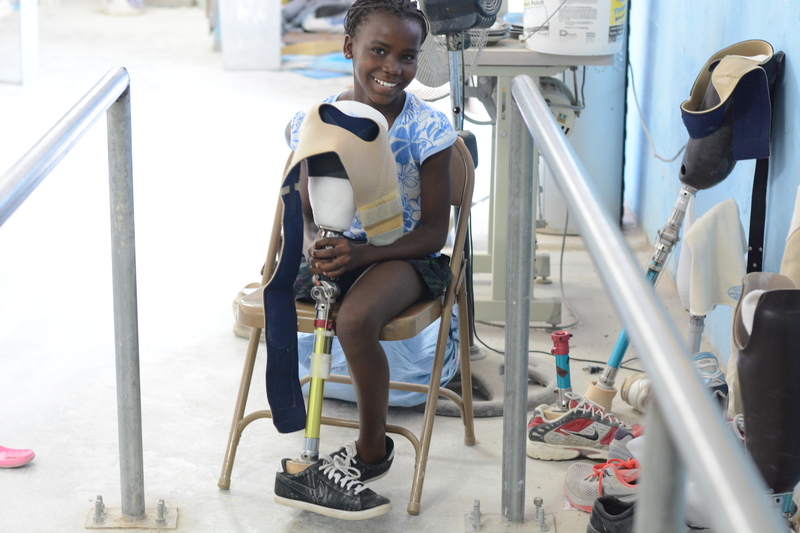 Monday morning of the last week of VBS, I saw her get off the bus for VBS and we went right up to the prosthetics lab. Our prosthetist had other patients in there that morning, so he told us to come back the next morning. 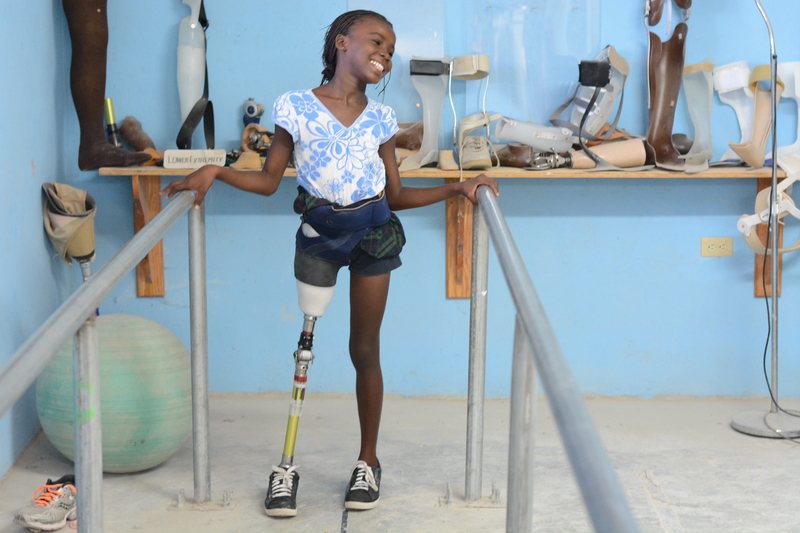 Tuesday morning came, Mydaline got off the bus, and we walked right up to the prosthetics lab again. 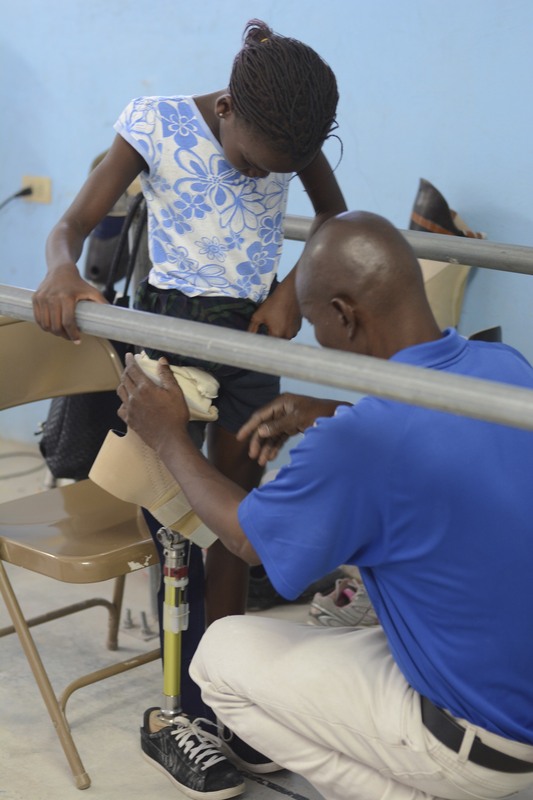 My heart was instantly filled with joy when NoNo, our prosthetist told her to sit down so he could get what he needed to make a mold of her thigh for her prosthetic leg. By the end of Tuesday morning, a mold had been made. 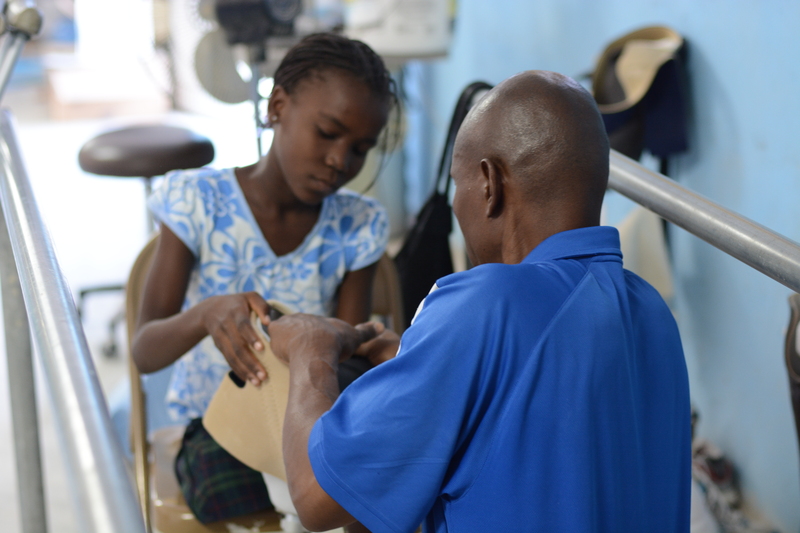 Yesterday morning, I met Mydaline and her uncle at the prosthetics lab for another appointment. 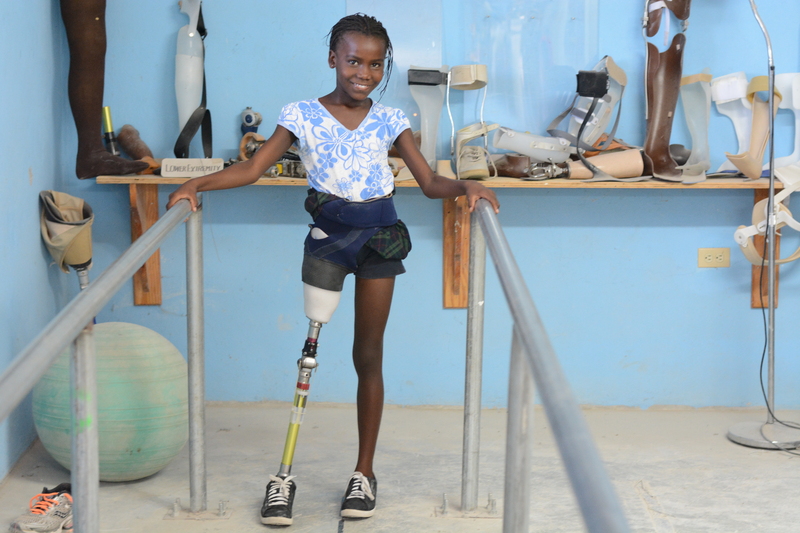 NoNo measured the length of Mydaline’s other leg and told her to come back that afternoon for him to see if her mold fits and if the leg is the right length. We came back around 1:00pm and he checked the mold, but didn’t have time to finish the rest of her leg. Again, he told us to come back the next morning. I woke up this morning very hopeful, but also a little anxious. Yesterday we were told there would be a chance she would get to walk for the first time today, but only if NoNo could find a foot the right size for her. As of yesterday afternoon he didn’t have a foot that matched the size of her real one. 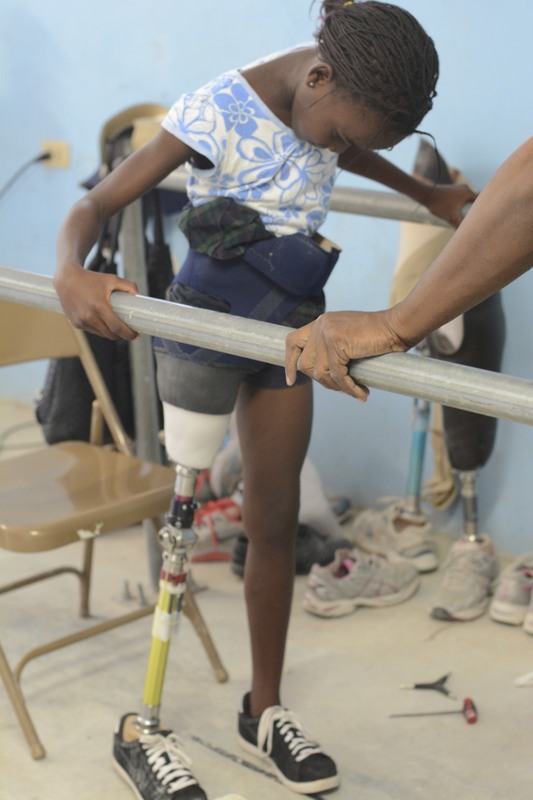 As I walked down to the prosthetics lab to meet Mydaline and her uncle, I was praying and just asking the Lord to let Mydaline see Him through this morning. That she would feel His love for her and know that no matter how long it takes for her to get a leg, He only wants good for her. What happened this morning left me in complete awe of how our Creator works. 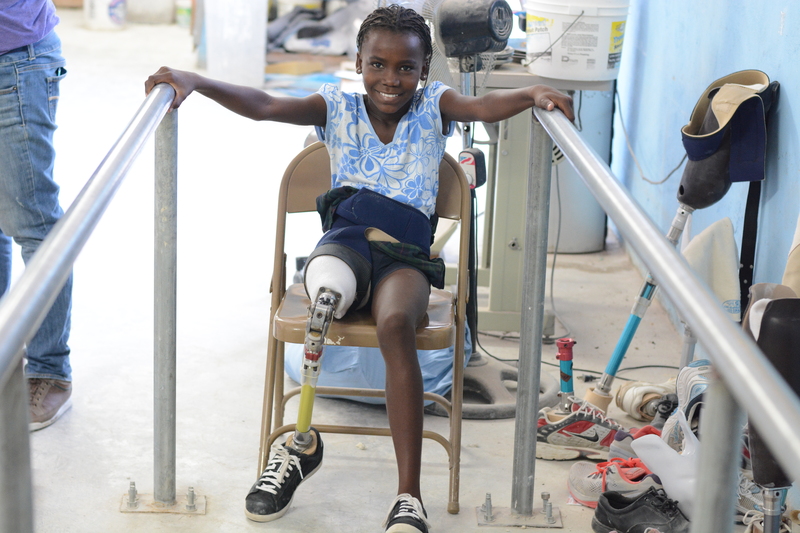 I arrived at the prosthetics lab to find a sweet little 8 year old girl who lost her leg in the earthquake. I talked with her and her mom while waiting for Mydaline to arrive. About ten minutes later, Mydaline walked in the door and when she saw another little girl in the room she instantly smiled. Not even five minutes after that, a little 9 year old girl came in too. 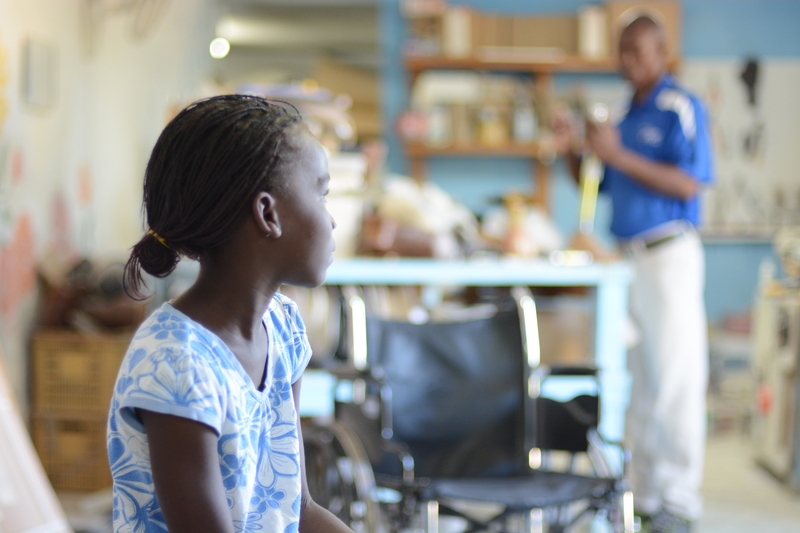 While NoNo was finishing Mydaline’s leg, the girls and their moms shared their stories. I sat and listened and was blown away by the sympathy they had for each other. As Mydaline’s uncle shared her story, I watched as the other mom’s faces felt the pain that I know Mydaline’s mom felt as she watched her little girl have to go through this tragedy. There was true empathy and compassion in their faces. They understood and showed so much love to Mydaline the rest of the morning. 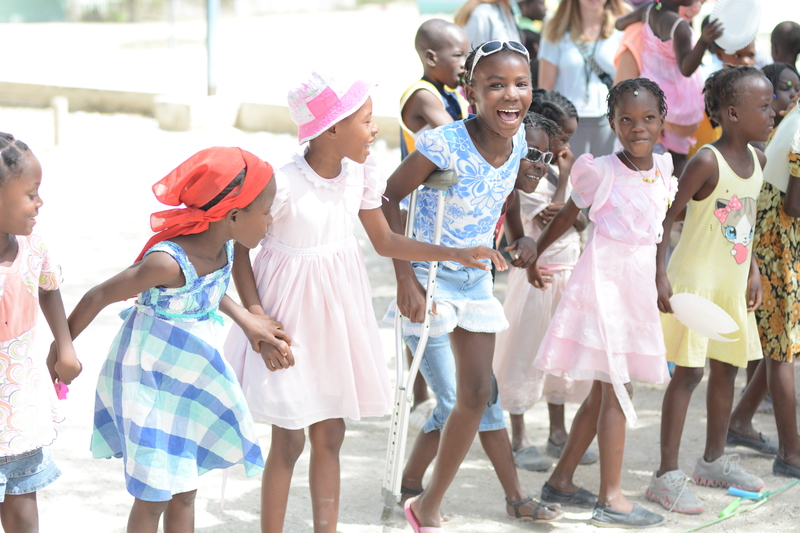 The room was filled with understanding of each other’s pain and circumstances, but even more so it was filled with the joy that there is hope to come. Then, it happened. NoNo brought the finished leg over to Mydaline and attached it to her. I’ve never met a girl so gentle, so sweet, and so determined. Within seconds of her wearing the leg, she started walking. 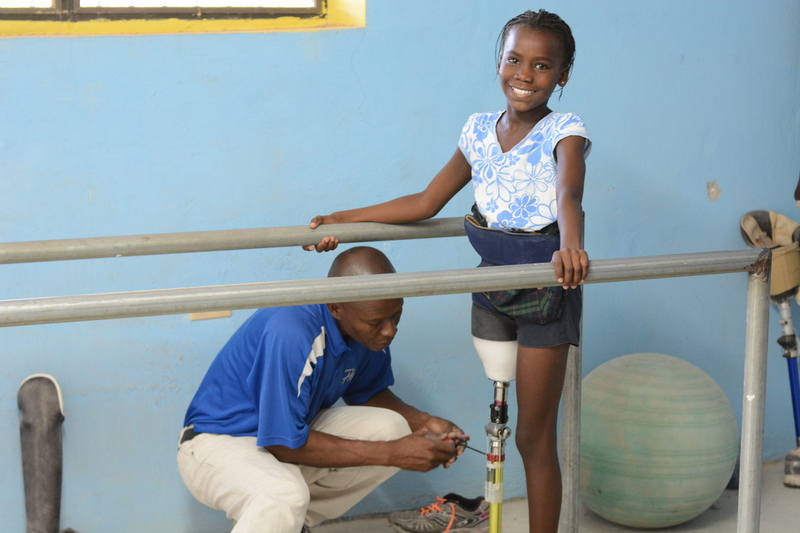 NoNo guided her in how to walk and taught her how to bend the prosthetic knee. Mydaline spent over an hour walking up and down over and over again. Each time with more strength. Each time with more grace. More confidence. More joy. S o m u c h j o y.
I cannot even begin to express the joy in my heart and I know in hers. For the first time in two years she could stand on two legs. For the first time in two years she could walk. For the ||very|| first time. Matt & I come to the states on Monday for vacation and some stateside work. I am so thankful for such a sweet way to “end” our summer here. Going into this summer, I asked the Lord to grow me and teach me more about Himself and surely enough, He did. I asked him to empty all of me so that everything that happened this summer would bring full glory to Him. He definitely did that. I asked Him to show me how VBS could bring true life transformation to a child. Oh my heart, did He do that! I’ve seen the Lord’s grace in Mydaline more than words can say. Through this precious girl I’ve learned more about the Lord’s love, joy, grace, and peace than I ever could have imagined. The Lord is so good and faithful.